We were disturbed to learn earlier this year that BPA, a potentially toxic endocrine disruptor found in everything from water bottles to soup cans, is present in significant levels on receipts from chains including Safeway, KFC, Whole Foods, and Walmart. And a recent study suggests that BPA easily penetrates skin. But all hope isn’t lost. 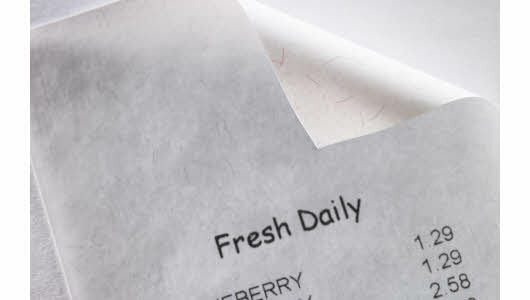 Appleton, the largest manufacturer of thermal paper and the only producer of BPA-free thermal receipt paper in the U.S, announced this week that it has added small red fibers to its paper so that shoppers and cashiers can immediately see when their receipts are BPA-free. Kent Willetts, Appleton’s vice president of strategic development said in a statement. The red markings will probably give anyone reading this article peace of mind. But what about shoppers that don’t know the significance of Appleton’s red fibers? Perhaps something a little more obvious–spelling out “BPA-free” with the fibers, for example–could help. Store employees may want to lobby managers to use Appleton-branded receipts for the sake of our health, and to encourage other thermal paper brands to ditch BPA. In the meantime, ask for your receipt in the bag–and handle with gloves.